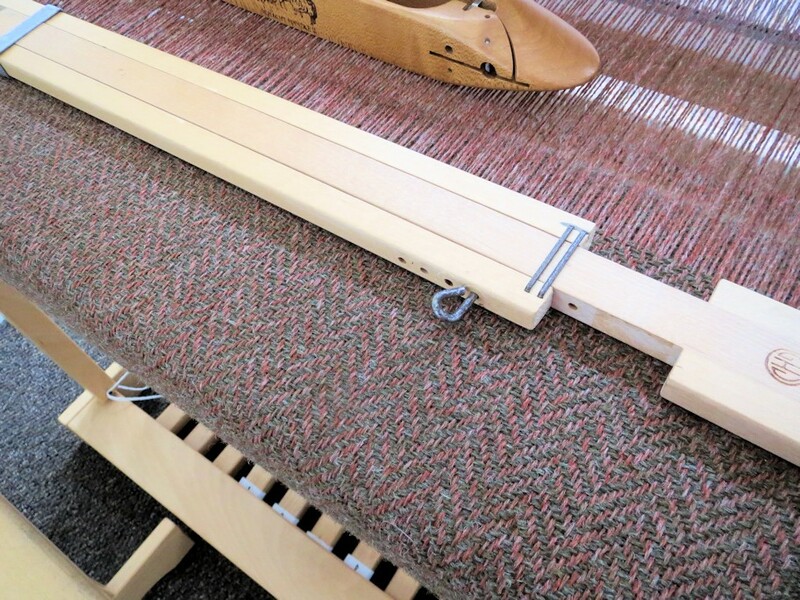 Shortly after the old loom left, and well before I was prepared for it, someone mentioned that they had my dream replacement loom for sale. After a flurry of activity, we drove to the edge of Scotland in a small hired van, to fetch it home. 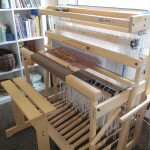 It’s’ Louet Spring 90 from the Netherlands with a massive 12 shafts and 14 treadles, rather more than I was going to go for! 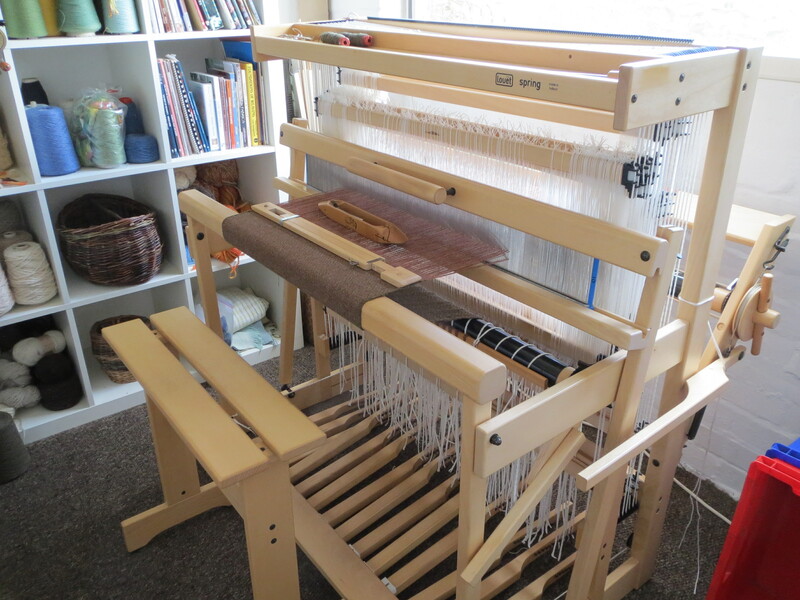 The loom sat in the lounge for a while while we rushed to finish the work room. It needed a lot of paint to cover a 70’s decorating disaster in pink, orange and khaki rag rolling, and a replacement for the flowered carpet. (Eventually we’ll add some insulation on the outside wall which has suffered from condensation.) 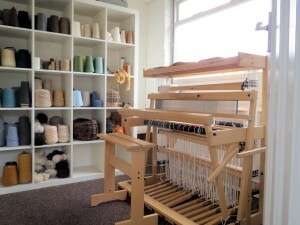 After we added the room divider that had come from the front room and moved the loom in, everything looked marvellous. Then it sat there … for weeks … we still had all the bother of a new house still to sort out! Finally, I’ve got started! 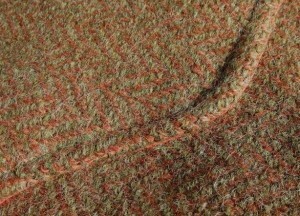 Some tweed with a shetland fine 2 ply for a bag. 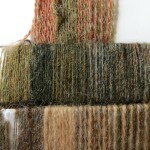 Colour sampling, warp winding, threading, weaving! 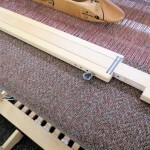 This is the easiest loom to setup that I’ve ever used! 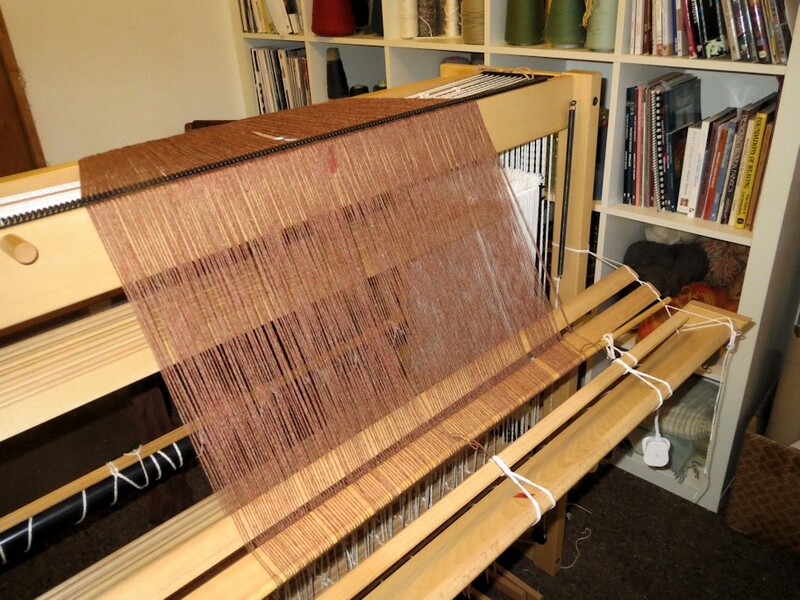 The tweed is woven, not much waste on a short loom (about 450mm). After washing the shrinkage is about what I’d allowed for so I think that I have enough length for the project. 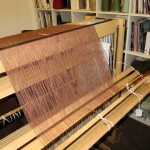 The cloth is heavier than I would like, so I will try a looser set next time or better, see how the the singles weave. Now I have to cut it up!! It appears that I’d misread the pattern and I needed to cut 3 pieces of one shape rather than 2. I can work round that. The inside of the flap will be contrasting cotton liner rather than tweed. I’ve also just found that the makeup description suddenly has a page about an inside pocket and the cutting list has no mention of that at all. Hey-ho no inside pocket I fear (I didn’t buy enough lining). But the bag is taking shape. 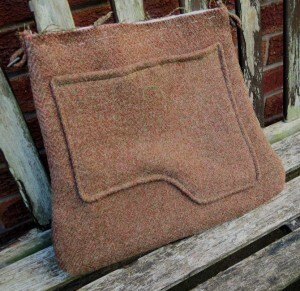 An external lined pocket is contructed and sewn to the front outer layer. 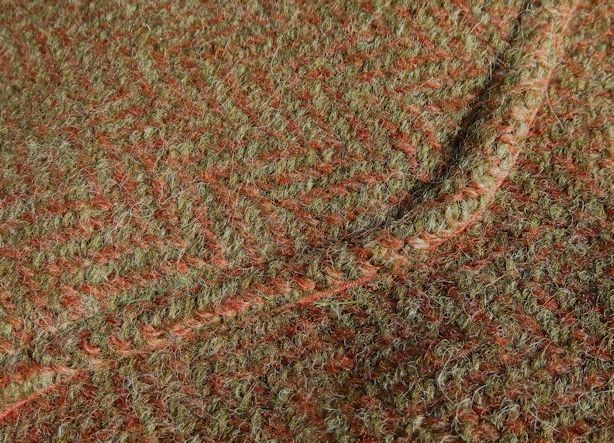 The outer pieces are interfaced and have a fleece wadding layer basted on. The darts to shape the base are made (handsewn since the thickness is too much for the machine!) and finally the outer pieces are sew together and tabs for the strap added. Next I need to construct the flap, then finally sew together and drop in the lining and make a shoulder strap. And it’s DONE – I’m quite impressed. 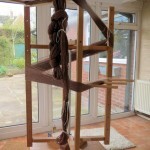 This entry was posted in Weavers, Spinners and Dyers Summer School 2011. Bookmark the permalink. 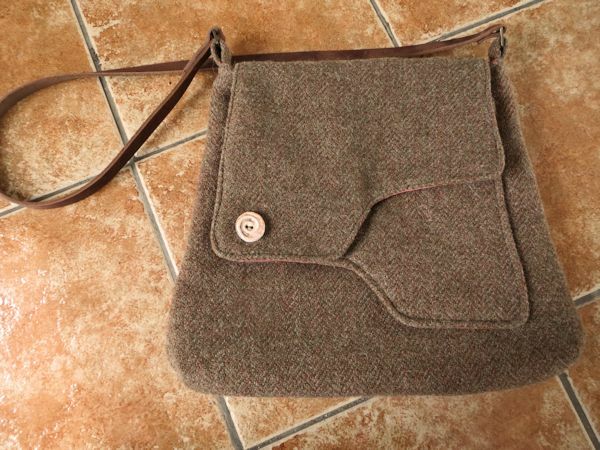 Love this bag – was it a personal design or is there a pattern/book we can find it in? A great pattern by Emma Brennan. You can buy them at http://www.charliesaunt.com/patterns/ (Downloadable). This one is Saxted. 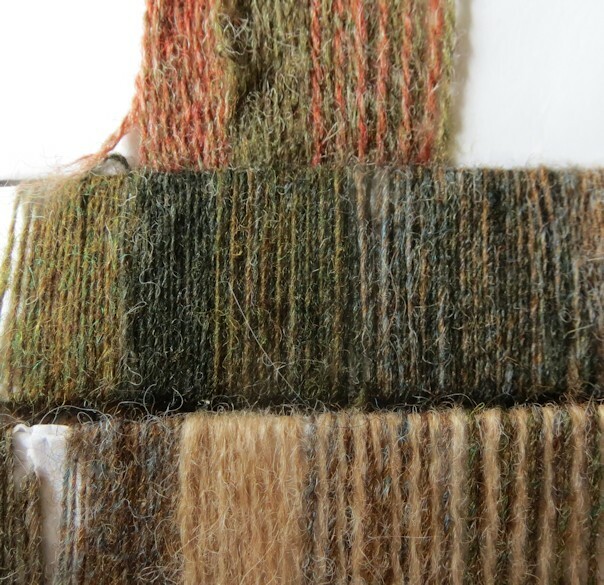 I’ve got another couple of patterns which I’d love to try when I get time.